For use on websites, this graphic tells the public you’re a supporter of The 3/50 Project. To use the badge, copy the coordinating code below, then paste it into the HTML of your website’s homepage where you want the badge to appear. Do not change any of the code or edit the image as this is trademark and copyright protected. Want us to link your name on the Supporters page back to your website? Cool. Confirm your listing appears on the Supporters page first (takes 7-10 days) so you don't have to do this part over again later. After your listing appears and the member badge is on your homepage, tell us about it. We’ll link your listing on the Supporters page back to your website (applies only to placements in the layout of your website homepage...not blogs or alternative pages). 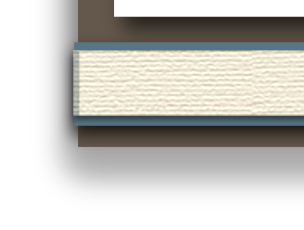 Small: 150 x 133 pixels; great for home pages and blog sidebar placement. Perfect for the top of your cash/wrap counter; fits a standard 8 x 10 frame. Just download the PDF file, print, and trim (there are even guide lines provided). Measures 36” x 50” to accommodate most large format printers. If you don’t have a locally owned printer who can print this, try Kinko’s as a last resort (hint: get a group of businesses together who want to order banners, then take advantage of the multi-banner discount—first one full price, each additional banner 35% off). Click here to download the zipped file. Four 60-second spots that remind consumers to shop with local independent businesses. Intended solely for use as PSAs (public service announcements), not part of a paid advertising campaign. To download the mp3 files, click here. Color art for use in newspaper and magazine ads, as well as in editorial pieces. Resizable, in high resolution jpg and pdf formats. Please note: In keeping with the legal notice at the top of this page, you can drop these into ads or editorial layouts as provided, with no edits or alterations. Well...not unless you’re really anxious to discuss trademark and copyright law with a really nice attorney we know. If you’re in need of custom graphics to fit specific ad sizes or needs, we do our best to accommodate. Drop us a line including full press specs. Custom work is based on availability; fees apply. Are you a media outlet interested in selling ads using The 3/50 Project name? Please check our FAQ page for guidelines. For use in movie theaters, this ad fills the screen as audiences wait for the film to begin. Sized to fit standard screens; static ad, no video. Please have the movie theater drop us an email to request it, including their preference of file format. 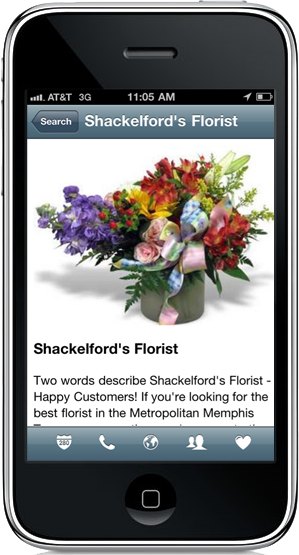 Created for florists and gifts stores, this small insert fits into the same envelope as a standard enclosure card. To make this as affordable as possible, it has been designed for digital press; please do not convert to black and white for litho or offset printing. NOTE: It is not intended to be used as a business card or calling card, so please don’t. Click here to download the zipped digital image. Created for printing on professional digital presses, these run 3-up on 8.5 x 11 cover stock (also printable on desktop units capable of running color with 1/4” margins). Click here for the pdf file. 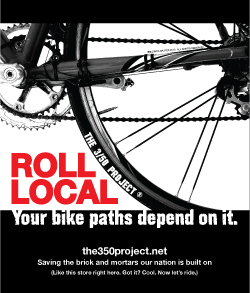 Not just for election years, here’s the artwork for yard signs showcasing The 3/50 Project logo and web address. They can be found in our store (see that tab at the top of this page? ); just select the category featuring our logo to find them. From magnets to mugs and t-shirts to tote bags, it’s all here. Hey, there are even bumperstickers for those who want to make the most of rush hour traffic. A portion of sales goes toward maintaining The 3/50 Project (since we don’t charge for any of the above materials). Visit The 3/50 Project Online Store by clicking here or on the tab at the top of the page. 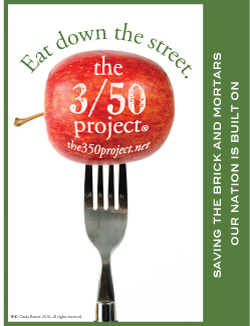 Visit us on Facebook at facebook.com/The350Project. Become a fan! Be sure to grab our button from Pieces of Flair for adorning your Facebook page. Click here or search Groups for “The 3/50 Project.” Please join us. 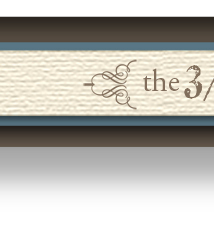 Cinda tweets updates about The 3/50 Project, in addition to new post alerts from her blog. Type that at the end of tweets you want to share with other fans of The 3/50 Project and it will blast right out to those of us who follow hashtags. Are you a Tweetdeck fan? Set up a new column for “3/50 project” and be in the know 24/7. To download Tweetdeck for free, click here. To sign up for a free Twitter account, click here. Feel free to forward these to local media; be sure they’re clear on the $50 part though—it’s $50 per month, not $50 x 3 stores per month. The media seems to misread this sometimes. Unlike other items on this page, it is acceptable to selectively quote portions of a press release without using the entire thing intact. If you think including Cinda Baxter’s voice (aka: The 3/50 Project founder) to the mix will improve the odds of getting coverage, please don’t hesitate to have your media contact drop us a line (see the Contact page for the press inquiries link). Interviews and comments are no sweat. Happy to help! A private, territory-protect online community for independent brick and mortar retailers in the gift, stationery, and home accessory industries. No competitors, no vendors, no paid sponsors. It’s all storefronts, all the time. A Buy Local campaign launched by the American Booksellers Association, this promotes independent retailers of all types, not just bookstores. Made specifically for those who want to show an image of the flyer on their website or blog. To use the web panel, copy the HTML code below, then paste it into your website template where you’d like the panel to appear. Do not change any of the code, edit the image, use clipped portions of the image, etc. as this is trademark and copyright protected, just like it says at the top of this page. Ooh...don’t miss this. It’s important. Note: We do not ever, ever, ever allow third party use of our horizontal banner logo, shown at the top of our website pages, flyers, signs, window signage, etc. Doesn’t matter what you intend to do with it. That one’s off limits. Sorry. See all that cool stuff below? Guess what? It's free. If you think what we're doing is worthwhile, and like the fact we provide a plethora of marketing materials to you at no charge, please drop a tip in the jar. Here’s where it all began. Just download...print out...and hand customers. It’s that easy. The flyers work best when handed directly to customers with their purchase or receipt, not stuck in the bottom of a bag. Look them in the eye, smile, and tell them thanks for coming into a locally owned business. Everyone likes to feel appreciated, after all. The flyer will open in a new window, and can take a while to load on slow connections since it’s high resolution. If a new window does not open, please adjust your browser settings to allow new windows or tabs to open when clicking on a link. Do you own a local independent brick and mortar business? Register as a supporter of The 3/50 Project and you'll be listed on both the website and in the app, free of charge. How's that for easy peasy?